Even the beefed-up Nook HD line released in September hasn't juiced Barnes & Noble's sales. Microsoft is reportedly considering a purchase of Barnes & Noble's Nook e-book business, sending the bookseller's stock soaring. The TechCrunch report, which cites leaked internal documents, says Microsoft is thinking about a $1 billion buyout of the Nook e-reader, tablet and e-book business. Barnes & Noble's stock jumped to end the day up 24%. Barnes & Noble (BKS) and Microsoft (MSFT) both declined to comment on the report. Microsoft has already proven its interest in Nook: In April 2012, Microsoft spent $300 million on a nearly 18% stake in the business. British book publisher Pearson (PSO) bought a 5% stake for $90 million in December. Amid these investments, the long-term view of Nook's future has been up in the air for quite some time. 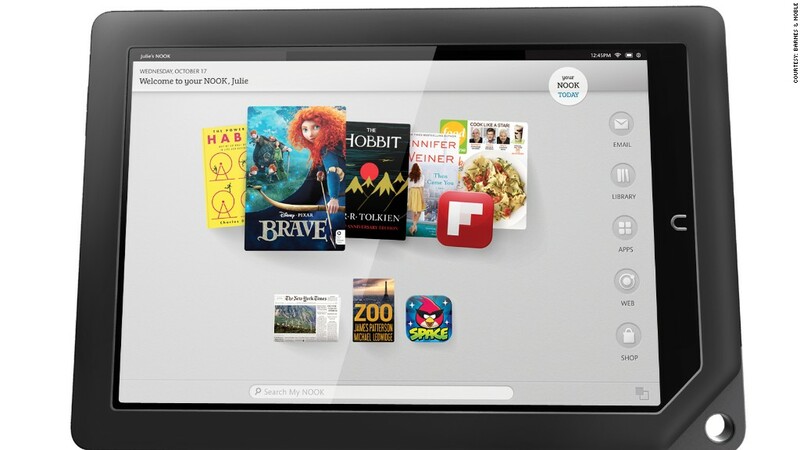 Barnes & Noble said in January 2012 that it was considering spinning off the Nook. In early 2013, Barnes & Noble chairman Leonard Riggio -- the company's largest shareholder -- disclosed a plan to buy the company's stores and leave the Nook business as a separate company. Barnes & Noble, like other traditional book retailers, struggles to compete with Amazon (AMZN). The bookseller has been unable to keep up with Amazon's successful Kindle e-reader as well: Nook sales have disappointed for several quarters, despite major device upgrades like the Nook HD release this past September. The new Nook HD product line features much crisper screen resolution than previous versions, a video streaming service and a nine-inch tablet size. Despite high hopes that the Nook HD would create a strong holiday boost, Barnes & Noble reported surprisingly weak Nook sales during the 2012 holiday season. Tablet and e-reader sales fell 12.6% over the year to just $300 million during that crucial sales period. Nook sales in particular "fell short of the company's expectations," the company said. For now, the company is continuing to upgrade its tablet lineup in an attempt to lure in new customers. Last week, Barnes & Noble announced it's adding the Google (GOOG) Play app store to the Nook HD line. But according to TechCrunch, Nook plans to exit the Android-based tablet business entirely by the end of its fiscal 2014. Instead, Nook e-books would merely be available through apps on third-party devices. It's unclear whether that would include only Microsoft devices, or other manufacturers as well. Clearly, the Nook HD line didn't pull Barnes & Noble out of the doldrums. But a $1 billion check could be the bookseller's saving grace.